Having a dog, it seems, offers a host of health benefits for people, and the list is growing. 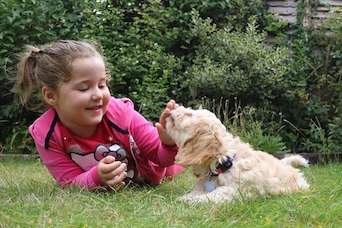 New research shows that dogs may protect children against the development of eczema and asthma. But according to 2 new studies presented at the American College of Allergy, Asthma, and Immunology (ACAAI) Annual Scientific Meeting in late October, exposure to dogs may help prevent both of these conditions in children. The first study, led by Detroit allergist Gagandeep Cheema, MD, examined dog exposure among pregnant women to determine the risk of childhood eczema. The research team found that children born to mothers who were exposed to dogs during pregnancy were less likely to develop eczema by age 2 than children born to mothers who were not exposed to dogs during pregnancy. For the study, “exposure” was defined as keeping 1 or more dogs indoors for at least 1 hour daily. “We found [that] a mother’s exposure to dogs before the birth of a child is significantly associated with lower risk of eczema by age 2,” said study co-author Edward M. Zoratti, MD. The researchers also noted that this protective effect decreased by the time the children reached age 10. The researchers found that exposure to the elements that dogs carry may protect against asthma, but exposure to the allergen itself may exacerbate asthma symptoms. If possible, restrict the dog to only a few rooms, and don’t allow the dog in your bedroom. Wash your hands thoroughly after touching your dog. Use high-efficiency particulate air cleaners and high-efficiency vacuums to reduce allergen levels. Bathe your dog at least once a week.